Welcome to seaside Sandy Bay, the golden mile suburb of Hobart. Savour the ever changing colors of the water and sky and watch the sailing boats from your balcony. The home is just a short walk down the hill (900m) to the Lower Sandy Bay shops and restaurants, via the historic Battery or the Promenade. The spacious home has two large living areas and a well appointed renovated kitchen. The balcony has a comfortable dining table and a BBQ. The dining table inside can comfortably seat 8 people. The lounge has a large sitting area beside the gas fire heater plus there is a powerful reverse cycle heater/air conditioner in the second living area. If you have time, you can retire to the TV room and enjoy the curved Samsung smart TV. Check out Netflix for free movies or select one from our dvd collection. Connect with Bluetooth to your favorite music or just enjoy the tranquility of your surrounds. The three bedrooms have comfortable beds. One has a king bed, second bedroom has a queen bed with en-suite (both have water views) and third bedroom has two single beds (garden view). Main renovated bathroom has deep bath and separate shower. Two people are welcome to stay in the house and have the house and garden to themselves but if they wish to bring extra people we charge extra per guest. We provide professionally laundered quality linen and towels. Breakfast provisions and toiletries are also provided. Feel at home in the kitchen. It has every gadget you need to cook any meal you want, even a large collection of recipe books. Enjoy a coffee and a meal at the local Beach Café restaurant or watch the sunset over the Derwent whilst you savour a great meal at Seagrass waterfront restaurant. Shop at the much loved by the locals and tourists Lipscombe Larder Sandy Bay supermarket which offers a huge array of fresh local Tasmanian treats, wines, bread and marvelous cakes. 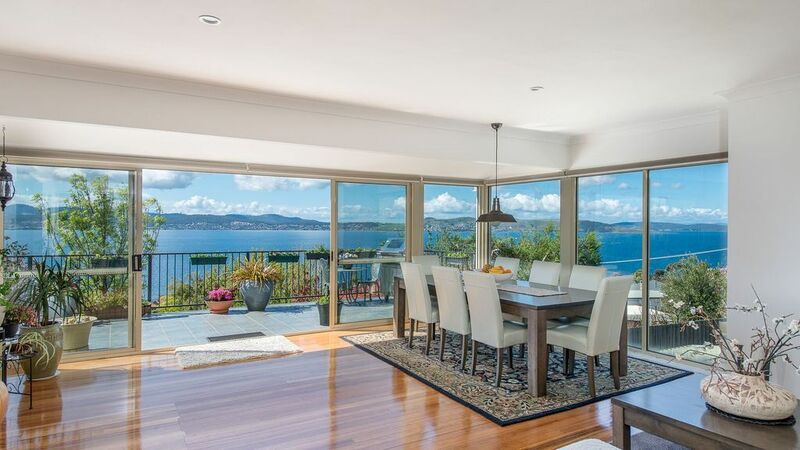 Cook in the beautiful kitchen or step out on the large balcony and cook a barbecue whilst you can enjoy the stunning views of the river, from the Hobart bridge to Betsy island. Underneath we have a one bedroom apartment. It is fully self contained, with separate entry and separate driveway and parking. Due to concrete ceiling, the sound is well insulated. If available you are welcome to rent this beautiful apartment called "Moonrise View". It can accommodate 3 people. Strictly non smoking indoors. We provide an ashtray outside on the deck. We respect our neighbours. This is a quiet neighbourhood so please no noise or parties. Beautiful house. Well equipped. Gorgeous view. We enjoyed immensely our stay in this exceptionally beatiful property that has outstanding views. There is a high quality entertainment sytem with large screen TV and the kitchen and laudry are fully equiped with top end appliances. Our lovely host Natalie went out of her way to make us feel welcome and comfortable. The views from this property were brilliant - from all rooms and then weather permitting the balcony is huge. 3 people stayed and we all found it cosy. Ample heating. Very quiet area and neighbourhood. Walking to closest shops whilst a brisk 10 min walk down the hill it is a little more on the return when walking back up the hill with groceries. Not suitable; so get supplies in the car first and save the walking for leisure. Location is great for viewing but an 1hr 15 brisk walk to Salamanca. The house has a very steep drive way which our van was not suitable to access without difficulties. Being a split level the house as outlined can be rented separately; we didn’t realise this so were a little taken back to see others in the yard and “house” noises at night. It does advise this on the web site, I would suggest alerting guests there are others just for security. The other suggestion I’d make is a house directory on every single detail about the house; heating, bins, tv, washing machine you name it (we loaded dishwasher and had to unload as we had no idea how to use it - it was 3 men staying after all so was missing the female touch) Other houses I’ve stayed have all had very detailed books/folders on all the workings of the house. Natalie was accessible for questions but you don’t like to call the host every 2 min. House would be great for a traveling family I’m sure. Ensuite to second room was very small and the person using this room found it difficult to shower in the small space. Overall nice place very cosy. The photographs do not lie! This is a truly superb home in a fabulous location. Spacious and light, it's a joy just to sit back, relax and enjoy the beautiful atmosphere and superb views. However if - like us - you are looking for a place that has all the conveniences of your own home, you will find it here. The fully equipped kitchen make it easy to enjoy wonderful fresh Tasmanian produce prepared your own way - there is everything you could need and more at hand, as well as a large laundry.Our family of four (2 adult offspring) were blown away by this wonderful base for our trip to visit family and friends. As an ex-pat Tasmanian I have no hesitation in recommending this to any visitor. I would recommend it is best suited to visitors with access to a car - which is required pretty much the case for anywhere in Tasmania. We definitely hope to return. Fabulous stay in a beautiful house. We really enjoyed our stay in this lovely house. The view was amazing and something you would never tire of. It was wonderfully appointed with everything you could possibly need. A perfect place to base yourself in Hobart. Real home away home, Natalie prepare and explain everything you need for the stay. Super clean (the best in my 3 weeks holiday in Australia). Beautiful view, close to beach and shops, quiet location. Cold in Hobart but never feel cold in the house. Love the "home" feeling very much. The last but not least, Natalie is an excellent host. Will definitely come back to stay if the house is available.